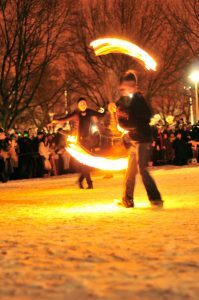 Kensington Market’s 28th annual winter solstice parade returns on December 21. Organized by Kensington-based Red Pepper Spectacle Arts and sponsored in part by the Kensington Market BIA and the Kensington Market Action Committee, the parade marks the returning of the light after the shortest day of the year, and features hand-made lanterns, theatrical scenarios, and a fiery finale at Alexandra Park. The parade starts at Oxford Street and August Avenue at 7 p.m., though lantern sales start at 4 p.m. Unlike the Santa Claus parade, this is a participatory event, so bring your own drum or pan, and wear a costume.